In this tutorial we will walk you through the steps on how to deploy a LEMP (Linux, Nginx, MySQL and PHP-FPM) stack with PHP-7.1 on a CentOS 7. A LEMP stack is a synonym of LEMP server or LEMP web server. It refers to a set-up which includes Linux, Nginx, MySQL (MariaDB) and PHP. We are going to install Nginx as it is a key component of our LEMP stack and will serve our website to it’s users. You can also check if Nginx is running by going to http://YOUR_IP in your web browser. Now we are going to install PHP7.1-FPM as we will need it to process the PHP files our website contains. Note: The configuration files for the PHP-7.1 Remi repository package are located in the “/etc/opt/remi/php71” directory. And now you should see your site up and running when you access http://example.com in your web browser. Note: Remember to replace example.com with your own domain name. 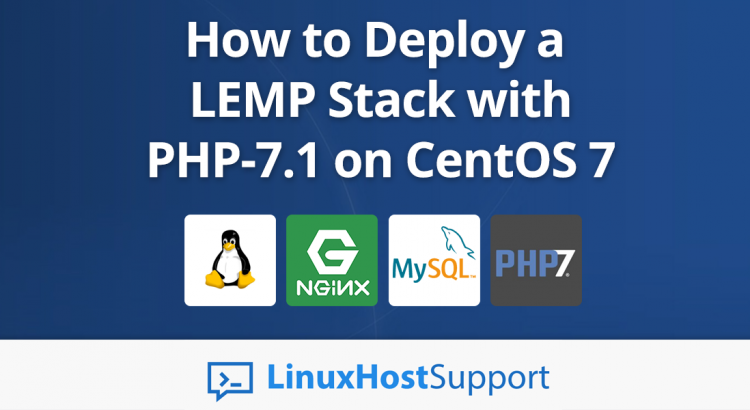 Of course, you don’t have to install a LEMP Stack with PHP-7.1 on CentOS 7, if you use one of our Linux Support Services, in which case you can simply ask our expert Linux admins to install LEMP with PHP-7.1 on a CentOS 7 server for you. They are available 24×7 and will take care of your request immediately. I created the php directory inside run [/ run / php /]. Then I created [php7.1-fpm.sock] inside php. By accessing the / run / executed [chown nginx. php -R]. Note that if you do not execute chown, the error below is reported. Then do everything above, which corrects the fault. My_IP – – [06 / May / 2018: 09: 46: 44 -0400] "GET /info.php HTTP / 1.1" 502 575 "-" "Mozilla / 5.0 (Windows NT 6.3; Win64; x64) AppleWebKit / 537.36 KHTML, like Gecko) Chrome / 66.0.3359.139 Safari / 537.36 "" – "
chown nginx. php -R didnt work for me but chown -R nginx:nginx php did. Excellent post, so far the best! Congratulations! Hugs from all over Brazil! What do you think of creating Part 2 to include PHPMyAdmin? As when I load site page it load only html page. PHP code is not loading. Please follow the steps carefully, you should be able to run PHP files.